I would love to take a moment to review "The Sriracha Cookbook (See all Herb, Spice & Condiment Cooking Books) " which arrived last January. I would also like to take a moment to tell you how much I love the book. But I can't. I won't. Why? Because I'm too busy stuffing my face with this recipe. Let's say this will be the shortest book review in history. I'm going to be lazy and point you to what others have said about Randy Clemens' book: It's a fantastic cookbook, and if you're crazy for the flavors of that garlic-and-chili sauce with the rooster on the bottle, then you really need the book. Really. It's wonderful. But about this pork. Oh, damn, this pork. Forget calling this "slow-cooked": You'll need an overnight brine plus an additional 12 hours of cooking time. Let's try "half-a-day-cooked-but-well-worth-the-time-invested," OK? But Randy lets us know there are no shortcuts to these types of flavors and he's right -- it's worth it. 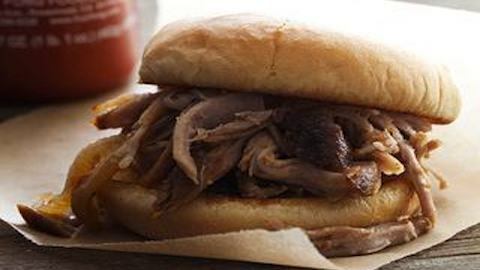 You'll need pork shoulder, spices, Sriracha and plenty of time. Then you'll need an appetite, your mouth, some sauce and that's about it. Marvel at how quickly the pork disappears, drizzle more Sriracha on top if you need it. And that's it, folks. Because there's really not much more to say about this perfect recipe for Piquant Pulled Pork. Recipe by Randy Clemens. "The Sriracha Cookbook: 50 "Rooster Sauce" Recipes that Pack a Punch (See all Herb, Spice & Condiment Cooking Books) ," published by Ten Speed Press. All rights reserved. To make the spice rub, in a small bowl, mix together the brown sugar, garlic powder, salt, pepper, cumin and paprika. Reserve. To make the brine, in a small bowl, dissolve the salt in the cold water. Add 2 tablespoons of the spice rub, the brown sugar, onion, garlic and bay leaves, stirring to combine. Put the meat in a large bowl or Ziploc bag and pour the brine over, making sure that the meat is completely submerged in liquid. Cover and refrigerate overnight. The following morning, drain the brine, reserving the pork and onion. Pat the roast dry with paper towels. In a small bowl, mix together the mustard and Sriracha. Using your hands, rub an even coating of the mustard mixture all over the pork. Sprinkle the remaining spice rub evenly over the entire roast, pressing it into the meat, making sure it adheres. Put the reserved onion in a crock pot. Pour in the cold water. Place the pork on top of the bed of onions, with the fattier side of the roast facing up. Cover and cook on low for 12 hours. At this point, the meat should simply flake away with the slightest touch. Remove the roast from the crock pot, and let rest for 45 to 60 minutes. This will allow the meat to cool slightly, which will in turn make it easier to shred. Pull the meat apart using two forks, discarding extra fat and other less-than-palatable bites. Serve hot. Recipes: "Piquant Pulled Pork "